Most gospel music fans know the smash hit “Praise Is What I Do”—the title track from Shekinah Glory Ministries’ 2002 gold-selling album—much better than they do the name of its writer, William Murphy, III. But that is about to change, and in bold and dramatic fashion. With the release of William’s own label debut album, "The Sound", the world was able to now hear the amazing voice and deeply moving songs of a young man who already is one of the brightest lights in the firmament of contemporary praise & worship music. William was presented the opportunity by Bishop Long to serve at New Birth in 2001. 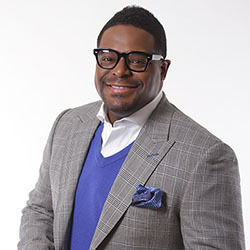 He and his wife and two children moved to Atlanta as he became the church’s Senior Minister of Worship, a position he held until December 2005. In January 2006, he and his wife, Pastor Danielle launched the dReam Center Church of Atlanta. The dReam Center Church of Atlanta is alive in the earth teaching men to cultivate, strengthen and build their personal relationships with Jesus, their wives, their children, their families and their communities thru prayer, worship, family, evangelism, education, wealth development and social action.